CopyLess is an advanced and flexible clipboard manager. Unlike the system clipboard CopyLess can store up to 100 items to which you have instant access at any time. With CopyLess is no longer necessary to switch constantly between different applications or windows just to copy and paste several different items. Everything can now be copied at once and pasted when and wherever it is required. Simple and intuitive user interface allows you to focus on your essential work and not on application itself and there are no distracting visual effects or inconsistent content presentation. - Everything you copy to the clipboard will be added to CopyLess list automatically. - Extend your clipboard up to 100 items. - Drag'n'Drop items between CopyLess and any other applications. - See instantly the preview of stored items. 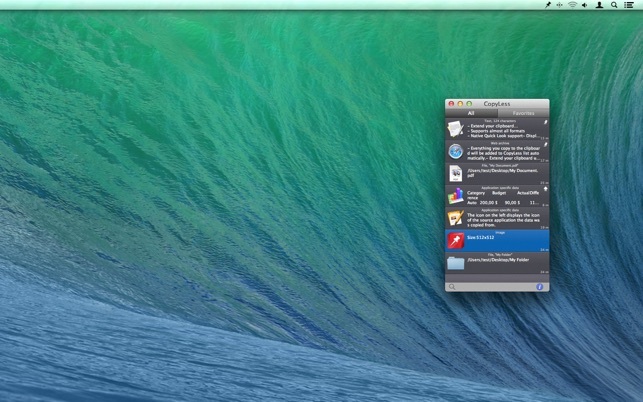 - Seamless Mac OS X Quick Look integration to preview the content of stored items. - Favorites list to store the items persistently. One click adds the item to the favorites list. - Paste as a "Plain Text" option. - Access the clipboard with a single user defined keystroke. 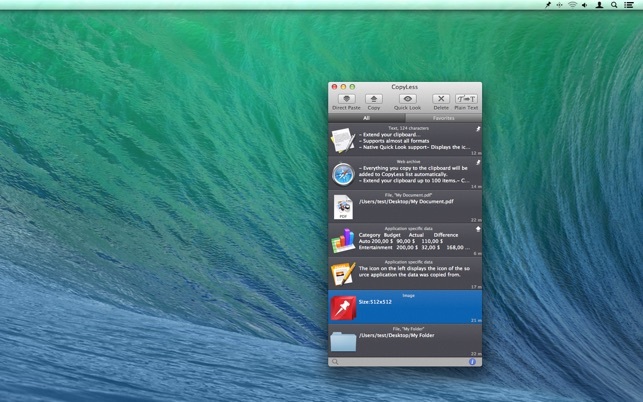 - Paste up to 10 recent items and 10 favorites with user-defined keyboard shortcuts without opening the main window. 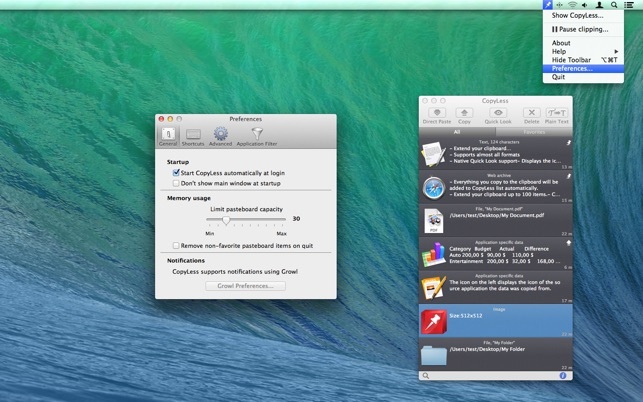 - Serial-paste support, paste up to 10 items in the same order you've copied them. - Application filter to ignore data from defined applications. 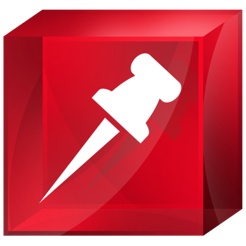 - Displays the icon of source application the data was copied from. - Integrated search to find fast the right item. - Customizable labels for stored items to find them even faster. - Put any element to the system clipboard without pasting it in to the active application. - Define the maximal number of items stored in CopyLess. - Optionally paste data with a single mouse click. - Integrated "Quick Help" immediately explains all important features. We are happy to answer your questions and help you in case there are any problems with CopyLess. I’ve been using this for years and it has been great. I used to have another one that was poorly maintained on the AppStore before I found this one. I think it is even better than the clipboard managers for Gnome, KDE and XFCE on Linux. Really well done and worth purchasing. I could sing the praises of the different features of this tool, but instead i will give you an example of why you need it always running in the background. I had been working on a report for about two days and keeping it in my [auto-sync'd folder] when the unthinkable happened. The main file and the backups in the sync'd folder became corrupted; then the corruption was populated across the different machines and remote server. Okay, yes i should have had alternate backups, but that is what an autosync'd folder is for! Bad file management practices aside, i was looking at missing my deadline and other consequences when… i looked over at my copyless window (75% transparent) and realized that 99% of my document was sitting nicely in the little rows in copyless which was tracking my every copy and paste as i was moving the different sections around. 5 minutes later file reconstructed and submitted. It is hard to explain how much time and frustration this little app has saved me. Copy multiple items to the clipboard - who knew!? I know this is not a new concept and I've seen these types of utilities before but never took the time to try them out. 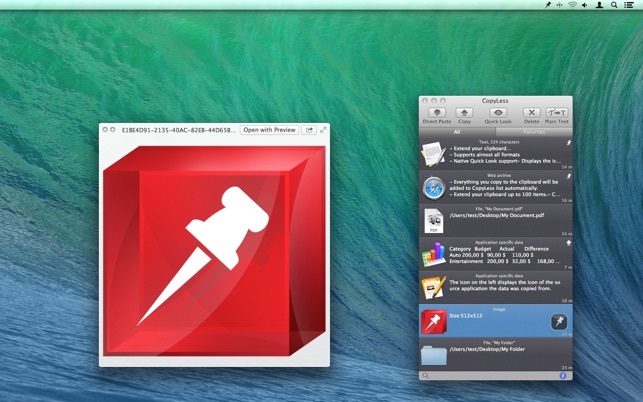 I came across CopyLess on the Mac App Store, installed the Lite version and started using it. What a difference! There are so many tasks that I perform on a daily basis where multi-copy has allowed me to be much more efficient and productive (with less pain) than my previous single-copy methods. I love that CopyLess is show/hide with a signle key combo. I really enjoy that allows you to quickly toggle 'plain text' (strip formatting) on or off. It did catch me a bit once because I had 'Plain Text' on when copy/paste some graphics between Keynote files and the paste came out weird. A simple toggle of 'Plain Text' to off and everything worked as expected. It has become an indispensible tool in my daily routines. Excellent job.